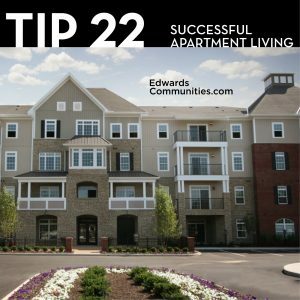 When you rent an apartment with Edwards Communities, you are choosing to make your home with us. We consider that an honor, and want your experience to be a positive one from the time you move in until the end of your lease. With over 30 years of experience under our belts, we have learned a few things about apartment living that we’d like to share with you. Tip 14: If you own a pet, be a good neighbor and clean up after it. There is nothing worse than seeing, smelling or stepping on an unwelcome surprise. Always take an extra bag with you on your walks just in case. If you always keep an extra one tied to the leash, you’ll always be prepared. 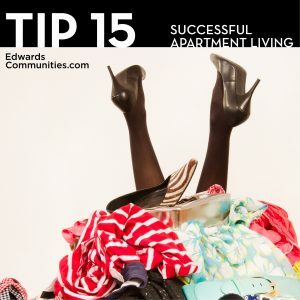 Tip #15: Do you have an organized, functional closet? Or is it filled with things you never wear? If you haven’t worn an item of clothing or a pair of shoes in a year, it’s probably time to say goodbye. Rule of thumb is if you haven’t worn it during a season, you probably won’t wear it again. So why not donate it to someone who will? 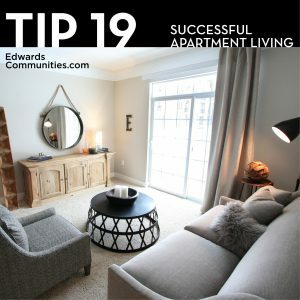 Tip #16: Add some “curve” to your apartment décor – round tables, rugs with spirals or dots, & furniture with soft edges. This subtle geometric change in your apartment could have a big impact on the look and feel of your décor. 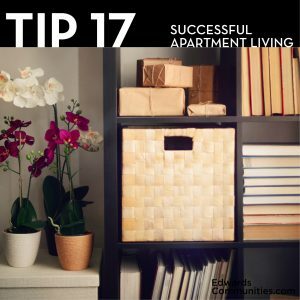 Tip #17: Make your space work for you. Ditch the dining room for an office, buy a fold-up bed or add decorative storage options to your walls. Prioritize what you need and choose accordingly. It’s fun to make your space uniquely your own and the most functional for you. Tip #18: Bedroom basics: If you’re on a budget or short on space, here’s what we think you will need: mattress, sheets/bedding, lamp, small end table, clothing storage. You can always add more at a later time, after you get settled and have a better idea of your spending routine. Start with the basics, and build from there. 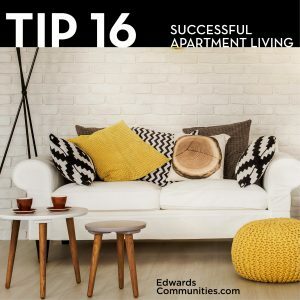 Tip #19: Living room basics: Our recommendation for living room necessities are a couch, small table or coffee table, and a lamp. Items such as a TV may or may not be considered a necessity. With so many TV and movie watching apps on smart phones, you might not need a TV at all. 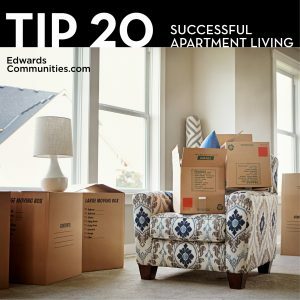 Tip #20: Moving soon? Don’t put off the packing. It’s a chore, but waiting to the last minute leads to frustration and confusion when you unpack. Packing is always a bigger job than you imagine. Don’t add to the stress by having to do it in a hurry. 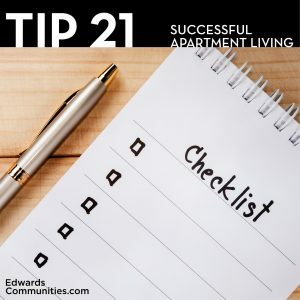 Tip #21: Check out these apartment checklists, with room-by-room necessities for a new apartment. What you really need, and what you can do without…. 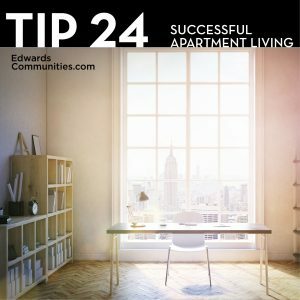 Tip #22: Looking for that perfect apartment? Think about location, affordability and amenities. Here are other suggestions for you to consider. This is a big decision, so do your research and consider all options. Call us if you have any questions! 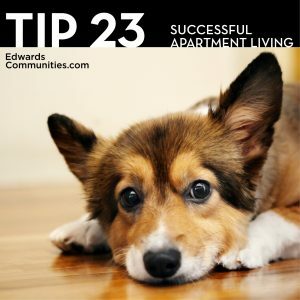 Tip #23: Are you a renter with a pet? Here are seven tips for successful apartment living with pets. Many of our communities allow pets. Please ask us about our pet policy when you call or stop by for a personal tour. Tip #24: If you work from home, position your desk near natural light. Studies have shown that exposure to daylight boosts productivity! A little sunshine goes a long way and has many benefits. You may still need your coffee, though. 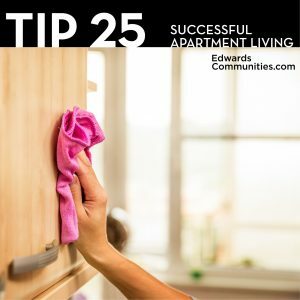 Tip #25: To give your kitchen cabinets a good cleaning, combine white vinegar and baking soda until it becomes a paste. Apply with a sponge, scrub well, and rinse with water. This is a safe and natural way to clean your kitchen. Try it on a small spot first before applying to the whole area. 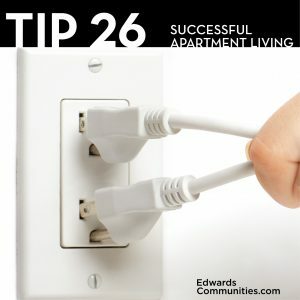 Tip #26: You could save on your electric bill by unplugging items when they are not in use, such as your phone charger, coffee pot, toaster oven and other small appliances. Some appliances take up energy just by being plugged in – even when they are turned off! “Unplugging” could put money back in your pocket! 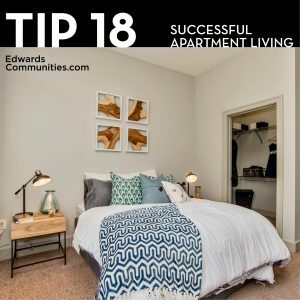 We hope you found these apartment living tips helpful! We’ll have a whole new Tips List for you next quarter. If you have any questions about Edwards Communities, our communities’ beautiful amenities, or where they are located, please visit our website!